Doha, Qatar – October 13, 2018 – A recently released five-year retrospective report examining media use in the Middle East found that Qataris are among the most digitally connected citizens in the Arab Region. In terms of internet penetration, Qatar has one of the highest internet use rates of any country in the world, approaching saturation at 95 percent. “With the goal of understanding the communication ecosystem in the region better, NU-Q launched the first of five Media Use in the Middle East studies in 2013. Now with this rare longitudinal study moving into its sixth year, we are able to evaluate lessons learned comprehensively and understand the value of both relative stability and media shifts – whether incremental or more significant,” said Everette E. Dennis, dean and CEO of Northwestern University in Qatar (NU-Q). The largest analysis of its kind in the region, the Media Use in the Middle East study examines media behavior across established and new platforms in seven countries: Saudi Arabia, United Arab Emirates, Qatar, Lebanon, Jordan, Tunisia, and Egypt. Extensive research was done on long-term social media patterns, how and where people seek news and entertainment, the connection between cultural traditions of the region, and comparisons among the studied countries. Additionally, perceptions of news bias and attitudes toward free speech and online privacy over time are explored in the retrospective report. 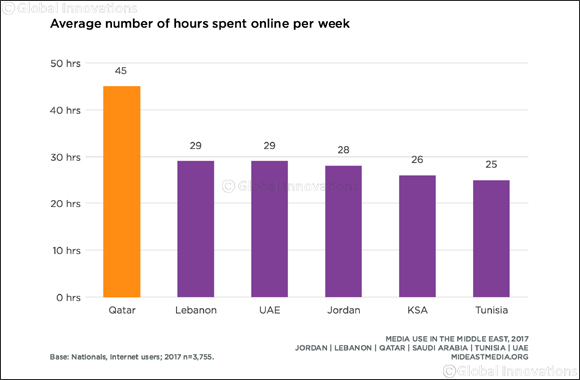 Qataris spend more time online than nationals in other countries in the Arab region – an average of 44.5 hours a week. Looking at the data comparatively, this is a substantial increase from 2013 when Qatari nationals reported using the internet an average of 37 hours per week. While they are spending 60 percent more time online than all other nationals in the surveys, Qataris are less likely to be engaged in several popular online activities, such as playing video games or using Facebook. An estimated two-thirds of Qatari internet users watch news, comedy and religious/spiritual content online, and now more than half watch sports online. A sharp increase across all fronts in these categories was seen compared to 2013 and make Qataris the first citizenry in this study to watch content more online than on TV. Remarkably, three in 10 Qataris say they never watch TV. Findings in the report show Qataris’ time spent online has increased but so has their time spent with family. They now report spending on average 43.2 hours a week with family. Discoveries such as these indicate that Qataris have embraced digital media but in ways that do not conform to several regional, and global, expectations. The data and analysis collected annually from the surveys reflect nationally representative samples of more than 1,000 respondents in each participating country (7,196 in total).